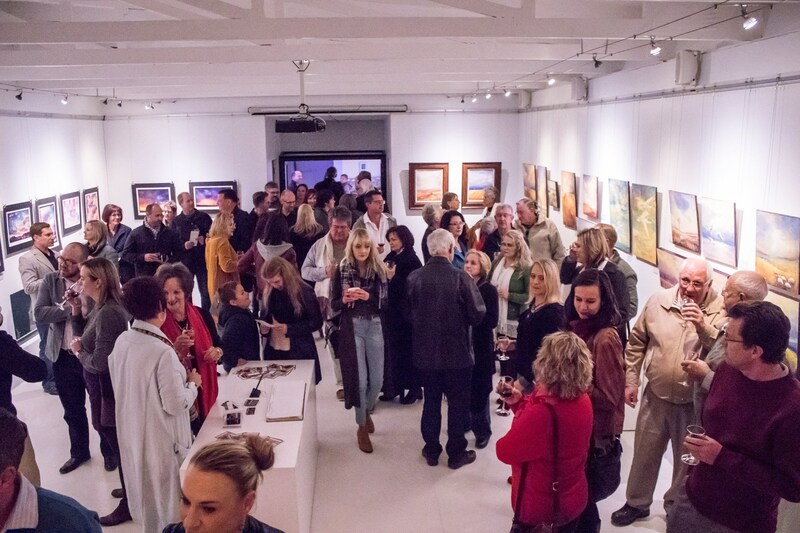 This gallery is in Dan Pienaar Drive in Bloemfontein. So many people attending, thank you so much for all your support and interest in the exhibition. As we are three family members exhibiting, Hanlie Kotze is my sister and Hester is our aunt, it was also like a small gathering of family, my parents, the artists, Kobus and Joe Kotze, came all the way from the small artists town, Rosendal in the Free State, thank you mom and dad!! Joe isn’t only my and Hanlie’s mother, but also the sister of Hester Hattingh who did the atmospheric landscape art. 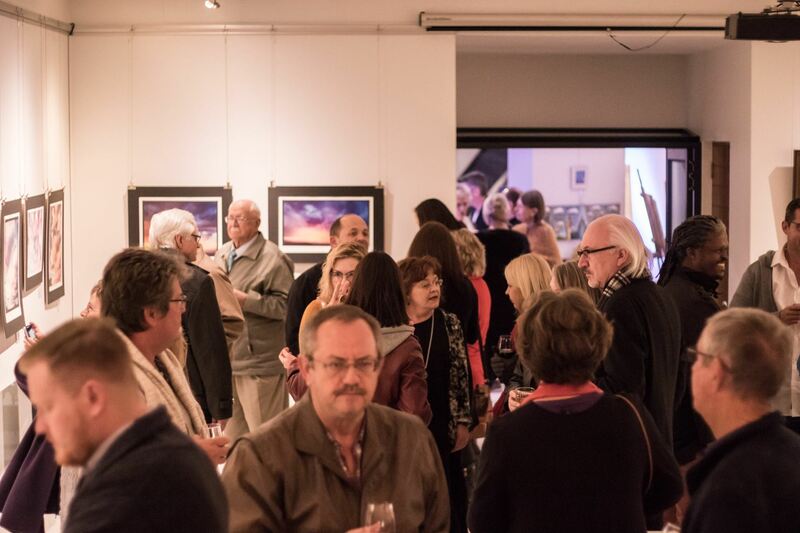 Guests at the opening night of our art exhibition. 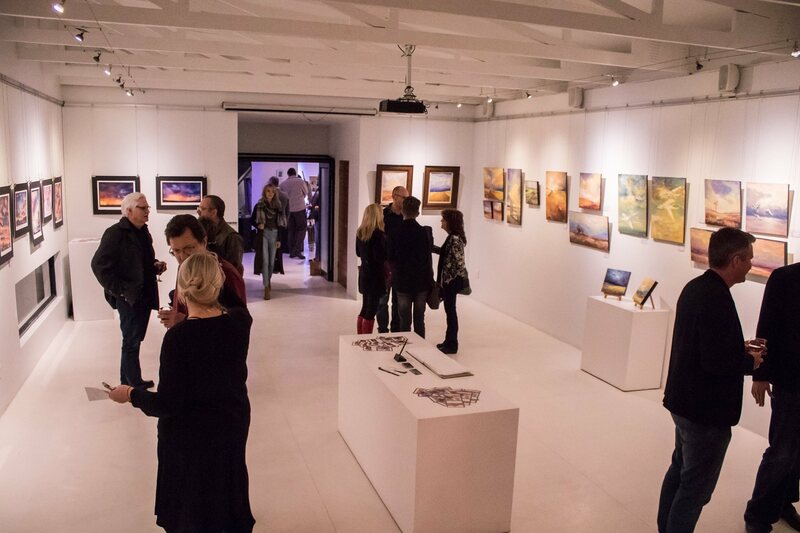 This part of the gallery is named: “The Bubble”, I feel that it is the perfect exhibiting space for my work. Not much time left until the 16th, be sure to visit this unique, beautifully curator-ed exhibition, and while there, treat yourself to a lovely meal or cup of coffee at 59Plenty . The very charming owner of this restaurant, Patso Nikolov, also lend a hand with the set up of the exhibition. Thank you so much to Gerhalda Nel, the manager (I think?!) 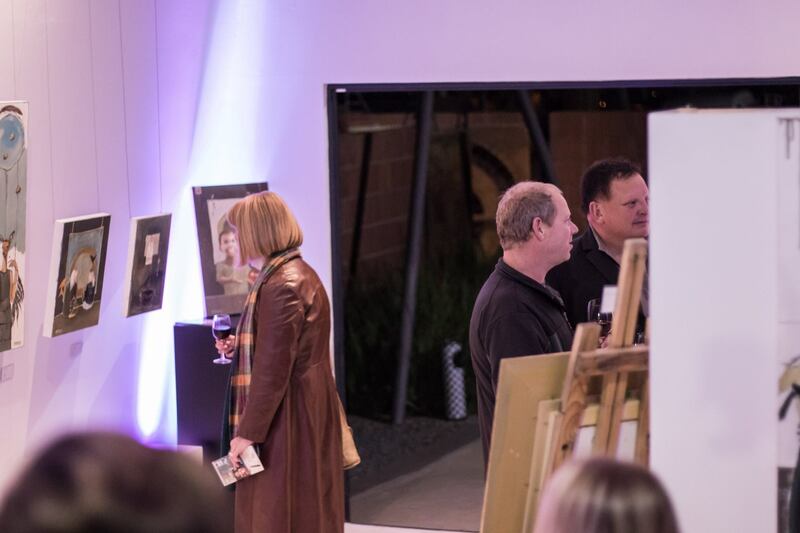 of the gallery, for all your effort and patience with our unorganized artists, and Dirk Kemp, the owner of the gallery, for this great opportunity to showcase our work in this perfect setting. I want to share the very insightful opening speech by Corneli van den Berg from Audeamus Studios, the speech is in English and Afrikaans because of Bloemfontein that is very much an Afrikaans community. I am an art historian – I don’t make art myself but I love and adore the visual arts. Hence, I am always impressed, blown away really, when people know how to visually express themselves in interesting and unique ways. 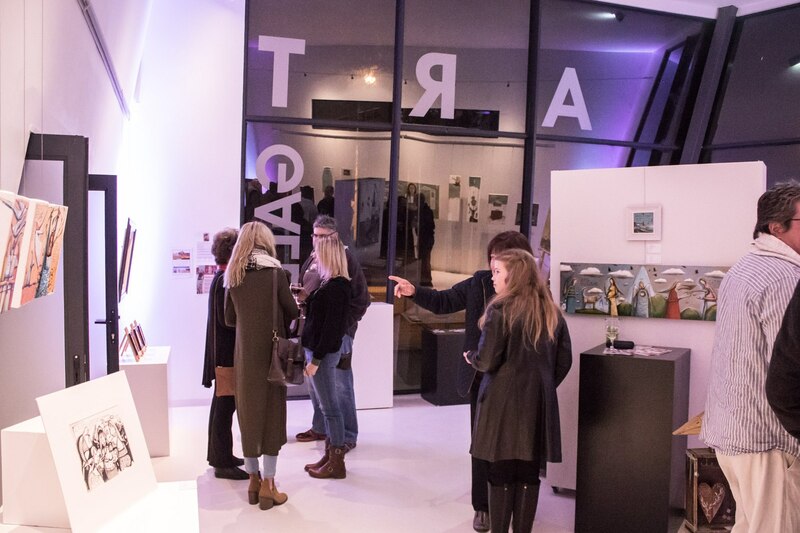 I think we can give the four artists on display here this evening a well-deserved round of applause for the creativity and inspiration on show in this exhibition. Wanneer ek van kreatiwiteit praat, verwys ek eintlik na ‘n algemene menslike verbeeldingsfunksie. Kreatiwiteit is eintlik ons verbeelding wat besig is om te speel. Hierdie aspek van die menslike verbeelding – kreatiewe spel – kom te voorskyn op vele terreine: mode-ontwerp, juweliersontwerp, in die kookkuns. The notion of creative, imaginative play is an element that I think binds this exhibition together. All four artists, in distinctive ways, display playfulness / speelsheid. Hanlie Kotze’s pieces included in this exhibition are all examples of a unique type of expression in western art history – the combination of word-and-image. From Medieval illuminated manuscripts, Renaissance emblematics, book illustration during the Romantic period until 20th Century Avant-garde art movement and collage = all combine words and images. Kotze’s pieces display playfulness both in their content, in what is represented, as well as in her combination of word-and-image. In verskeie gevalle skep sy die indruk dat sy vir haar gehoor knipoog – sy speel met ons. Mariaan Kotze’s artworks are playful in an entirely different manner. She creatively merges, fuses and also juxtaposes compositional elements in her paintings. These elements function symbolically, with birds, wings and feathers suggesting freedom, communication and new beginnings. Her juxtaposition of unique elements is reminiscent of French Surrealism, which makes sense, since like the Surrealists, Kotze credits subconscious dream fantasies for her creations. Kotze allows her subconscious and her dreams to creatively play. Hattingh betrek dus ook haar toeskouers in ’n spel van kleure en van kleur en tekstuur. 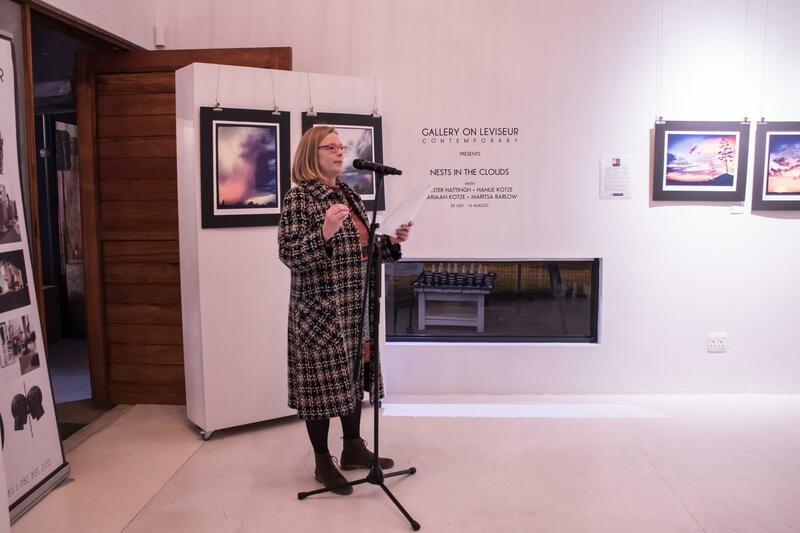 Maritsa Barlow’s landscape photography displays a similar play with colour and texture. The striking colours of the Free State sunsets she captures show the entire spectrum from the delicate and soft pink to the sharp and intense orange-red of the early evening sky. The textures of the clouds she photographs also covers the complete continuum from soft and fluffy to dark and ominous. Barlow’s game is played with the subgenres of the landscape tradition in Western art history. Her photographs recall not only very early instances of landscape painting they also resonate with both the picturesque and sublime subgenres, reflected in the spectrum of colours at play in the cloudscapes she represents. 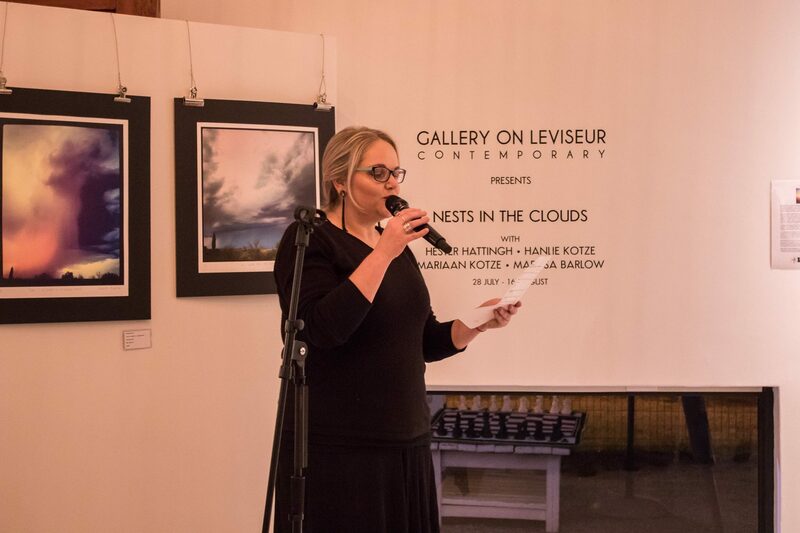 Posted in Blog and tagged Art Exhibition, Hanlie Kotze, Surrealism, Bloemfontein, Kobus Kotze, Joe Kotze, Gallery on Leviseur, Maritsa Barlow, Dan Pienaar Drive, 59Plenty, art gallery, Hester Hattingh, Opening night, speech, Corneli van den Berg, Landscape art, cloudscape, surrealistic art, impresionism, photography, Audeamus Studios.